The following article was sent in by Joshua McDaniel. McDaniel is a senior economics major from the University of North Texas and is serving as Chairman of the UNT College Republicans. One of the biggest controversies of 2012 was the vast budget cuts in education spending in Wisconsin by Governor Scott Walker and the newly-elected cast of Republicans in the State Legislature. As the nation witnessed swarms of school teachers and their students storming the state capital, Governor Walker didn’t flinch. He stuck to his stance that the state government needed to make these cuts in order to get its’ fiscal house in order. Many of the cuts were to teacher pension funds and other benefits paid for by taxpayer dollars. Eventually, this led to a recall election for Walker and his supporting cast, and in one of the biggest political statements of the year, Walker and every one of the state legislators won their recall election in a huge landslide victory. The victory marked a strong message to unions and the education system across America. 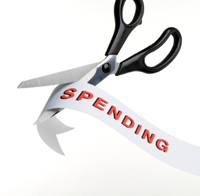 Texas education funding, like Wisconsin, was also cut in the last legislative session. According to politifact.com, per-student spending was decreased by an average of $500 per student in Texas. This number was down from almost $8000 to just above $7000 a year per student. This decrease in state funding may be due to the trend in the last decade for increased spending by individual school districts in Texas. The graph below shows this trend. Recently, the Economist magazine started a project called “The Learning Curve” that aims to help policymakers, educators, academics and others to better understand the factors which go into having an effective education system (thelearningcurve.pearson.com). So far, research has shown that there is still a lot we don’t know. However, one theme the authors hoped to hammer home was that throwing money at a faulty education system will not fix it. The authors describe the phenomena as multiple factors going into a black box (education) and results pouring out of the other side. We have no idea what went on inside that black box. Another point the authors made was that per capita income is affected by the education system, not the other way around. In other words, better educational outcomes promote higher per capita income, per capita income does not promote better education. It also said that better educational outcomes are a result of a culture that promotes better educational systems. 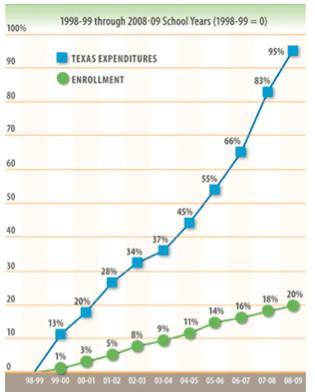 The fact of the matter is that the trend of the last decade in the Texas education budget begs the question: Are marginal costs really that steep? Is another student in the classroom really five times more expensive than the previous amount? Every year, students in elementary school are required to bring new supplies to be shared by everybody in the class. My question, what happens to all the scissors every year?